Highest amount paid for gold from Casino Pawn and Gold! How does "Cash For Gold" work? Our "Cash For Gold" process allows you to turn your gold, absolutely any gold that you might have into cash! The process is simple, you bring your gold items to our pawn shop in Casa Grande, also serving Arizona City, Maricopa, Eloy, and Coolidge, where we will test it for purity and weight. Once tested, we will offer you the most cash for your gold and you will be walking out of the store within a matter of minutes with the cash you need in hand! GUARANTEED! It really couldn't be easier. If you need money, we will give you the most cash for gold. Why get "Cash For Gold"? The price of gold is at a high point which means more money for you. So let us say you have a gold chain and you need cash. The answer, "Cash For Gold". Perhaps you have an old ring that is out of style or doesn't fit you anymore Again, "Cash For Gold". Even if you have some broken chains, bracelets, rings or what you might call scrap jewelry gathering dust in a box somewhere. You got it, "Cash For Gold". Casino Pawn and Gold is determined to pay you more money for your gold than anywhere else. We never do credit checks and you get cash for gold in minutes! What type of gold is applicable for "Cash For Gold"? Our pawn shop will buy any and all types of gold. We will buy everything including gold chains, gold rings, gold watches (working or not), broken or damaged gold jewelry, estate jewelry, gold bullion (in bars, coins or ingots), dental gold, gold brooches, gold pendants, gold cuff links, and gold earrings. No matter what condition the gold is in, we will buy it with cash for gold! Come down from Casa Grande, Maricopa, Arizona City, or Eloy, and get the most money for your gold today. What is a fair deal when exchanging "Cash For Gold"? Weight is the most important factor in determining the value of gold. However, there are factors to take into account such as the condition and the purity of the gold. Sounds simple right? But here is where you need to be careful. There are ways that stores cheat on this by classifying 18K gold at 14K (generally most items are stamped -- if it is stamped 18K, then odds are it is very close to 18K). So, if you see someone testing your gold which is stamped 18K and telling you it's 14K, that's an issue. Maybe they will call it 18K, but pay you at 14K because of a "typical" lack of purity. Some stores have ways of pricing that is misleading.They will quote a high per gram price, but then deduct so many fees that there is nothing left. In addition, they may not have licensed scales. In some cases, they are not properly licensed to buy gold which allows them to cut corners which in turn, costs you money. They can sometimes claim a loss during melt (there is a loss, but it varies depending on what is being melted). After reading this, we've probably got you thinking to yourself, how can I trust anyone? It's simple. At Casino Pawn and Gold we want you to come back whenever you might have a need. We also want you to be able to tell your friends or family that if they are in a need for cash or just want some extra cash, the too can come to our pawn shop and be treated respectfully, professionally and fairly. We are determined to make you feel confident that you get the most cash for your gold. We will explain the process and how we came to the price we give you so that you fully understand the procedure for appraising your gold for cash. What about the "Cash For Gold" or "Cash 4 Gold" stores I see on TV and on the Web? Everyone recalls seeing www.cashforgold.com or www.cash4gold.com on TV. These huge, commercialized companies are SCAMS. A simple Google search brings up things like this "http://consumerist.com/2009/02/02/10-confessions-of-a-cash4gold-employee/". They pay you next to nothing, and you will never get your precious gold back. YouTube has over 7000 videos on Cash For Gold with the top videos having MC Hammer or some other celebrity in them. These companies are spending a TON of money to advertise and what that means is that they typically are paying much less to cover their costs for this advertising. We are in a convenient location with low overhead and a VERY small advertising budget. We are not telling you to bring your gold to us simply because we say that we will pay more. We just thought some discussion on alternatives might be worth it to you. 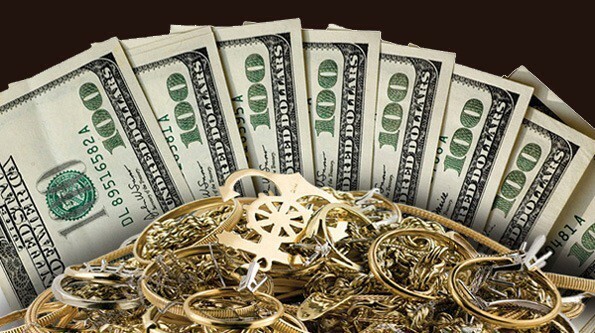 With over 30 years of experience in buying and selling gold and stores throughout Casa Grande, Arizona City, Eloy, Maricopa, and Coolidge, we are confident of how we do business and we are sure you will find that Casino Pawn and Gold will pay anywhere from 50% to 300% more "Cash For Gold" than they will. Why should you come to Casino Pawn and Gold? Our pawn shop and its brothers and sisters has over 30 years experience in buying and selling all types of gold. Over the past 20 years we have grown to the point that we have been able to open stores throughout the State. We have the knowledge, experience, and cash to make you want to come back and see us, therefore, you can be sure you are getting the most money for your gold. We give the most cash for gold, and also serve the Coolidge, Maricopa, Arizona City, and Florence Area.